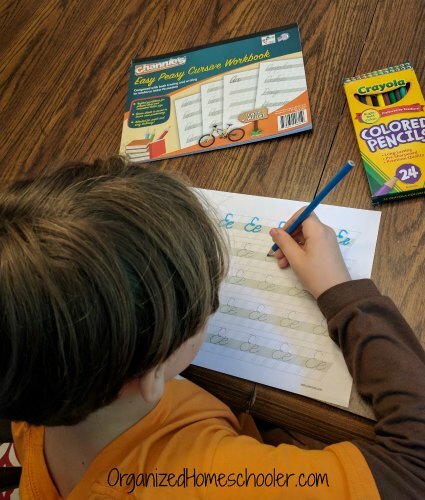 I believe every child should learn to read and write cursive, so I jumped at the opportunity to review the Easy Peasy Cursive Workbook by Channie’s Visual Handwriting & Math Workbooks. Learning cursive has not only the obvious benefit of being able to read documents and write a signature. Research has also shown that it stimulates synapses between the left and right hemispheres of the brain, which increases comprehension. Printing does not offer this advantage. Ben was very eager to give this workbook a try. I think that he saw cursive as a secret code that only ‘grown ups’ could read. 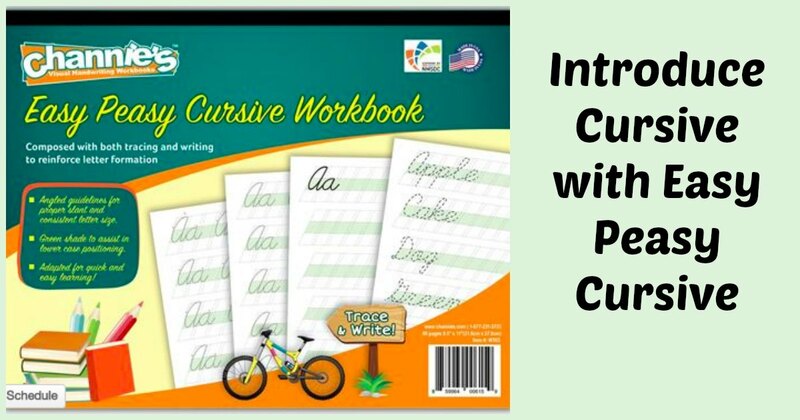 This workbook was his first foray into the world of cursive. 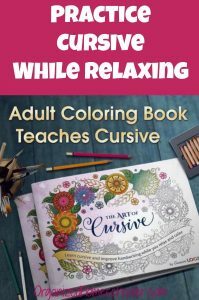 The Easy Peasy Cursive Workbook pages contain angled guidelines to help children begin slanting their letters. This guideline helped Ben naturally make this adjustment with no difficulty. In fact, he didn’t even realize he was doing it until I pointed it out to him. The guidelines also have color coded blocks that help with letter positioning. There is a well defined area for letter ‘hats’ and letter ‘tails’ , as we call them in my house. Letters are presented in alphabetical order. 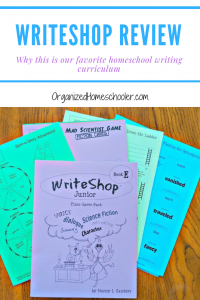 Each letter has three practice pages in the Easy Peasy Cursive Workbook. The first two pages require the student to trace the letter. There are guiding arrows to demonstrate how to form the letter. The final page is a place for the kids to try writing the letter on their own. Each cursive lesson begins with me introducing the letter. I write the uppercase and lowercase letter on the whiteboard that hangs in our dining room, making sure that Ben is watching me. He doesn’t need to be reminded to pay attention though. He is eager to learn the next letter in this ‘secret code’. Ben writes the uppercase and lowercase letter on the whiteboard too. This lets me check for any glaring letter formation issues. Once he has the letter formation down, I give him a page from the Easy Peasy Cursive workbook and a colored pencil. 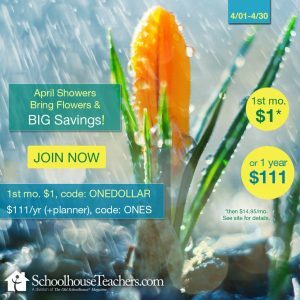 We are working our way slowly and carefully through the workbook by doing one side of a page a day, 4 times a week. We work on handwriting Monday – Thursday. Friday is our ‘minimal schoolwork’ day. I like that there is a Quick & Neat Cursive Writing Pad available for sale. We will probably use this paper for extra cursive handwriting practice after we finish the workbook. 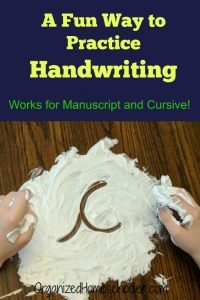 I think the Easy Peasy Cursive Workbook is a great introduction to cursive handwriting, but there is one problem we are needing to work around. 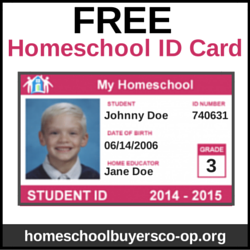 There is no review throughout the workbook. Once a letter is taught, with the exception of a few letters that are used in words on the last two pages, it doesn’t show up again. That is fine for introducing cursive, but won’t lead to mastery. We are working around that by reviewing letters on our own by spelling words as we learn more cursive. 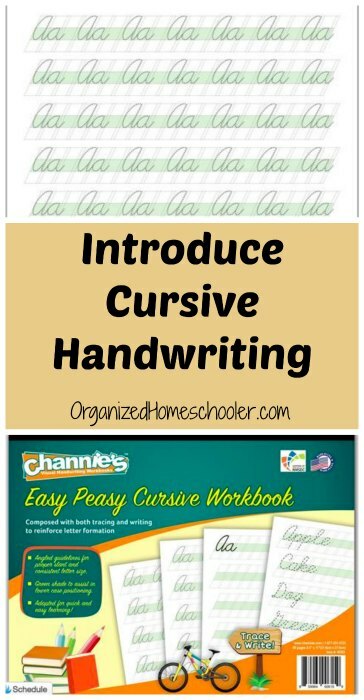 Not quite ready for cursive yet? 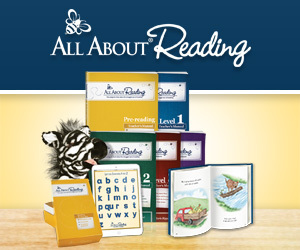 There is an Easy Peasy Alphabet workbook available to help teach manuscript letters.